On Friday, May 18, the start of Victoria Day long weekend, Edible Canada at the Market is reopening their busy Take Out Window for the summer. Building on last year’s incredible success at their Granville Island location, the culinary team has created a brand new menu centered on the global infatuation with bacon – with a Canadian twist. Coast to Coast – A Canadian Tribute to Bacon will highlight culinary traditions and fresh ingredients from here to Halifax with regionally inspired bacon-themed dishes. All of the new items will be available through the Take Out Window only, and additional items will be added as the season progresses. 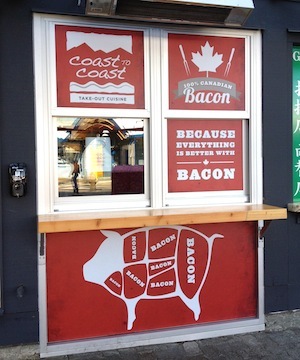 Widely recognized for their innovation and promotion of new Canadian cuisine and our country’s artisan beverages, the Coast to Coast – A Canadian Tribute to Bacon window reinforces Edible Canada’s mission to support and showcase artisan culinary producers and our vast food culture. The hours of operation will be 11am to 7pm daily.